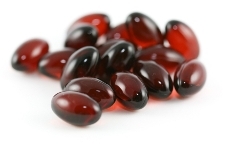 Krill Oil is a powerful source of Omega-3 fatty acids, which are beneficial in joint conditions such as rheumatoid arthritis, osteoarthritis and also has a beneficial effects on general and heart health. GO KRILL OIL 1,500mg 1-A-Day Super Strength contains high potency Red Krill O..
GO KRILL OIL 750mg REFLUX FREE is a highly bioavailable source of Omega 3 wit..
GoodHealth Red Super Krill + Glucosamine - Triple benefit: Mobilises + Repair..
GoodHealth Red Super Krill 1000mg - Superior Omega-3 absorption Contains..
GoodHealth Red Super Krill 750mg - 9 X stronger than fish oil for joint healt.. Nature's Way NZ Red Krill Oil + Glucosamine combines the power of Red Krill Oi..
Research has shown that Krill oil provides superior absorption compared to Fis..